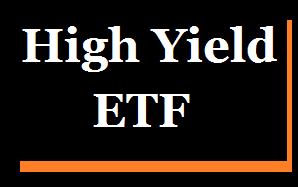 Find top high yield bond ETFs 2014 review. These high yield bond funds invest in low rated corporate bonds. If you are looking for yield, high yield bond funds may provide an attractive choice for you. As discussed, these funds invest in low quality corporate debts. It provides high yield income for investors. You can buy ETF funds from your brokerage just like stock or CEF funds. As part of taxable bond fund, it may have shorter duration than high quality bonds. These top performing high yield exchange traded funds are sorted based on its year to date return in 2014. You can find other fund review information below. I have listed the expense ratio fee, yield or distribution rate, leverage, share price, NAV, holdings, top sectors, and more. 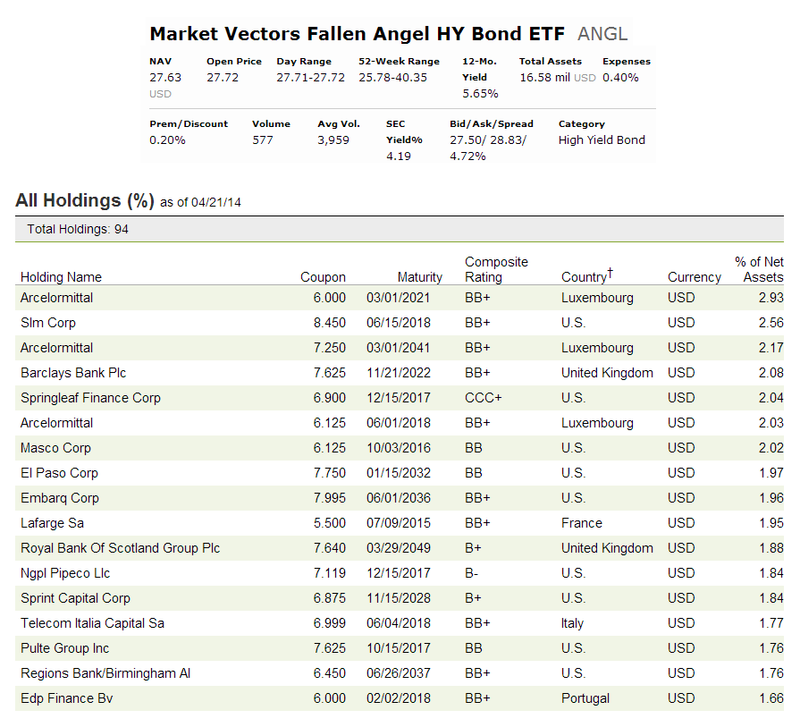 Market Vectors Fallen Angel HY Bond ETF was introduced to investor on April 2012. This new fund is not ranked by Morningstar yet. The total assets are $16.58 million. This exchange traded fund is currently traded at $27.67. The index provider is BofA Merrill Lynch. In 2013, this top high yield bond ETF fund has returned 7.24%. In 2014, it has YTD return of 3.75%. The fund has 1-year annualized return of 0.78%. The top holdings as of April 21, 2014 are Arcelormittal (2.93%), SLM Corp (2.56%), Barclays Bank Plc (2.08%) and Springleaf Finance Corp (2.04%). Guggenheim BulletShares 2014 HY C Bond ETF seeks investment results that correspond generally to the performance. The fund’s annual expense ratio is 0.42%. It has dividend yield of 3.33% and is distributed on monthly basis. Morningstar analysts rank this top high yield bond ETF fund with 2-stars rating. It has average maturity of 4.19 years. The YTD return is 0.21%. It has 1-year annualized return of 3.03% and 5.54% 3-year annualized return. The top holdings are Treasury Bill (15.50%, Transdigm Inc (3.00%) and Reynolds Group Iss (2.88%). The top fund sectors are Finance (21.86%) and Consumer Services (12.22%). The investment objective of iShares iBoxx $ High Yield Corporate Bond is to track the investment results of an index composed of U.S. dollar-denominated, high yield corporate bonds. Since this best high yield bond ETF fund was incepted in 2007, it has received 3-stars ratings from Morningstar. It has total net assets of $13.27 billion. The annual expense ratio is 0.50%. The CUSIP is 464288513. 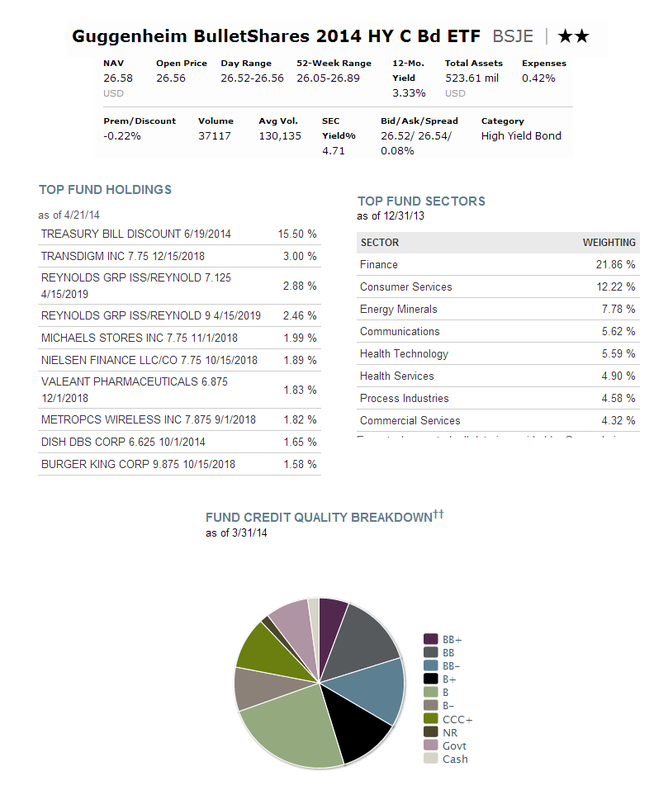 The top 3 bonds in its holdings are Blackrock FDS (1.32%), Sprint Corp (0.56%) and First Data Corporation (0.44%). The top sector is Consumer Services (15.25%), Oil & Gas (12.90%) and Financials (12.86%).